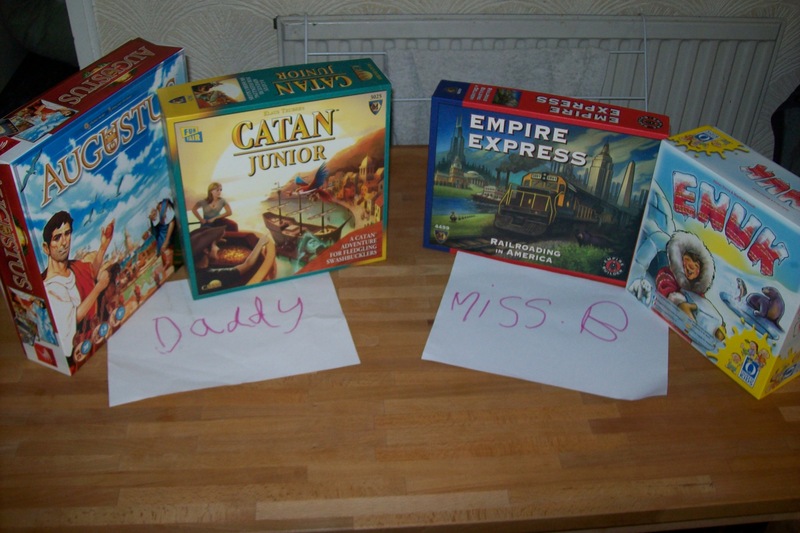 So we had an afternoon free, so I challenged Miss B to a game of Empire Express. It doesn’t really take that long to play (maybe an hour or so these days, plus some set up and clear away time) but it is long enough that it can’t just be played on a whim any time we fancy. This being one of her favourite games, she readily accepted the challenge, but added that she also fancied playing Yahtzee, a game that she has recently developed quite a taste for. No problem, I said, would you like to play Yahtzee first, second, or play them both at the same time? What was meant to be a little joke was greeted by bright, wide eyes and an enthusiastic request for the at-the-same-time option. And that’s what we did. While one of us drew lines on the Empire Express board and moved our train around, the other was rolling dice and noting down scores. I was busy trading in goods for $profit$ when I heard a gasp and Miss B was holding out the dice tray to show me her second Yahtzee of the afternoon, meaning lots of points. Yahtzee is a rather shorter game than Empire Express, with only 13 turns, so it finished while we were probably two thirds of the way through the bigger game, after which things seemed actually a bit dull. Miss B had beaten me soundly with the dice and I was at that stage of EE where you have enough track and the right contract cards that you just chug along knowing that you will finish the game in a few more turns, as long as you don’t get derailed anywhere. The session finished with an equitable win for each of us and high-fives all round. I think we agreed that the whole exercise of simultaneous games was fun, but neither game turned out to be as good as it would have been with both of us paying proper attention. Probably a lesson for life there. So, at last we come to the final stage of the 2013 Golden Game Awards. 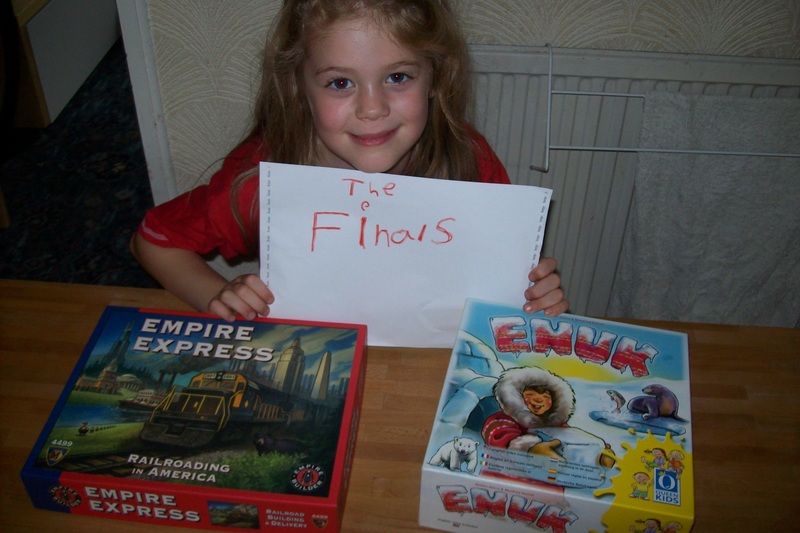 The remaining competitors are the fun kid’s game, Enuk, and the slightly cut down rail game, Empire Express, both of which were Miss B’s nominations at the first stage of the competition. Just so you know what the competition is: Empire Express versus Enuk. 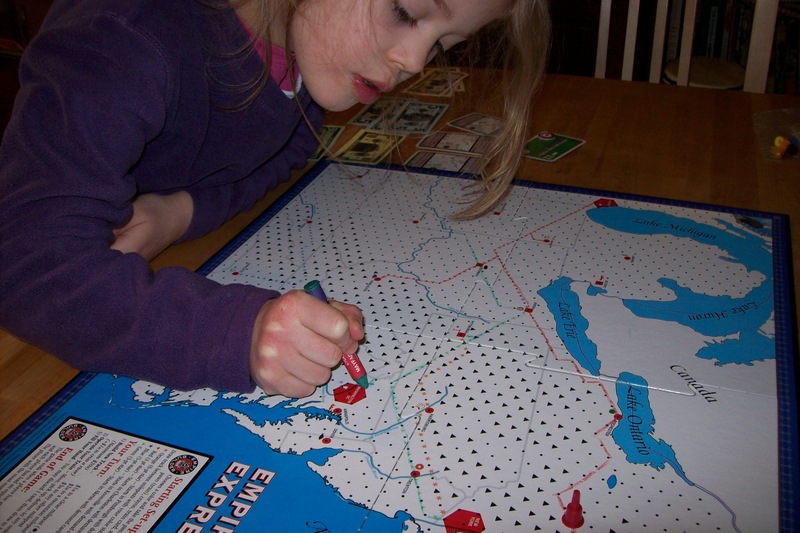 For the final we played Empire Express first. Having played this very recently, Miss B was instantly right in the swing of things and figuring out where she wanted to deliver goods. In Empire Express I generally help her by pointing out the locations and sources of goods that come up on demand cards and pretty much leave her to it apart from pointing out a neat route if she seems to be struggling. This seems to work well and the only trouble she really has with the game is when the crayons break due to her slightly rough handling of them. The manufacturer claims that the crayons are very special ones and that we shouldn’t use regular ones on the board (I know the quality of crayons can vary wildly, so this seems plausible to me), so it would be nice to get hold of a fresh supply of unbroken ones some time. The game gets into its late stages with Miss B running maple syrup to Pittsburgh to put her within striking range of victory, but can I get my imports to Chicago first? This game took us about an hour, which surprised me as I was expecting longer. In our previous play, Miss B caught me napping and beat me into the ground, but this time it was much closer and I just managed to scrape a win, just scraping past the winning post the turn before Miss B would have gone screaming past it. High fives all round for a very close game. Our game of Enuk was also pretty close. Certainly more so than our last game, during which I was pretty much served. Miss B made an excellent start, while I seemed to unerringly (and un-herringly) pick up a piece of igloo every time (which ends your turn). Still, I eventually managed to find the scoring animals and due to having to resort to the unsportsmanlike tactic of actually paying attention, I managed to catch up and squeeze in a narrow win again. Enuk is definitely a game we play on an even footing, which makes it well worth having in the collection. As I said after our previous play, the game is growing on me and was definitely worth the few quid it cost us. The winner does a lap of honour with Miss B.
I got this game after someone recommended it to me on Board Game Geek after I asked for recommendations for train games that might work for Miss B and myself, and it turns out this was a very good pick. We’ve had a few plays so far and once the current set up gets a bit old, there is an advanced way of playing in the rules which is more like the full crayon rail games where you don’t get the easy start that we have been using here. All in all, I’m happier with this purchase than I thought I would be. Thanks for the recommendation, whoever you were! It’s time for this year’s first game-off between contenders for the coveted Golden Game Award. The winner of this epic battle will win a place in the final and a chance to go down in history as a game that Miss B likes more than some other games on a particular day. Miss B introduces our contenders for the day. In the Red corner, nominated by Miss B herself, we have a game that represents an entire family of boardgames that allow you to draw on the board with crayons. It’s a game that is nowhere near as pretty looking as its competitors, but it’s one that rewards strategy, planning and luck, and involves building a huge rail network in order to deliver goods throughout the North-east of the USA. Yes, it’s Empire Express. In the Blue corner, nominated by me and representing the hopes and aspirations of what is probably the biggest gaming franchise of the last 20 years, the Catan empire, we have a game that allows you to trade goats for cutlasses and swap stuff for parrots: Catan Junior. To be honest, I’m a little surprised by the selection of Empire Express, but also very pleased by it. I like the “crayon rails” range of games, having played several of them in the past, though they are notable for being quite time consuming to play for fairly low complexity games. Empire Express cuts out some of the options and gives you the option of a flying start, and makes the whole game playable for the two of us in maybe an hour and a half now Miss B knows her way around the game. 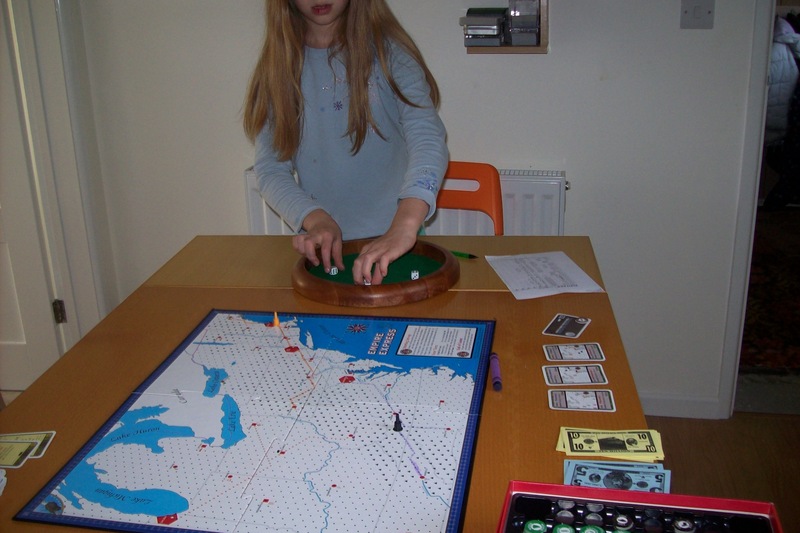 Still quite a long time for one game with a six-year-old, but it’s just about manageable. This play went well and really held Miss B’s attention throughout. Thanks in part to some good card draws and me trying to be too clever for my own good (though it must be said, my track was beautiful, I just needed a longer game…) Miss B won. Actually, she didn’t just pip me at the post, she totally walked it, leaving me at least a couple of deliveries behind her. Well played! As for Catan Junior, we always get on well with that one and it plays quickly, usually in the ballpark of half an hour. There was a little complaining when I built a pirate lair where Miss B wanted to go, but then she managed to get her own back soon afterwards. This time, though, her usual strategy of buying lots of parrot tiles (which give assorted bonuses) wasn’t quite enough and I managed to win by the narrowest of margins. Based on this assessment, Miss B has awarded Empire Express 16 out of 20 and Catan Junior 15 out of 20, and thus our first finalist for this year is Empire Express. 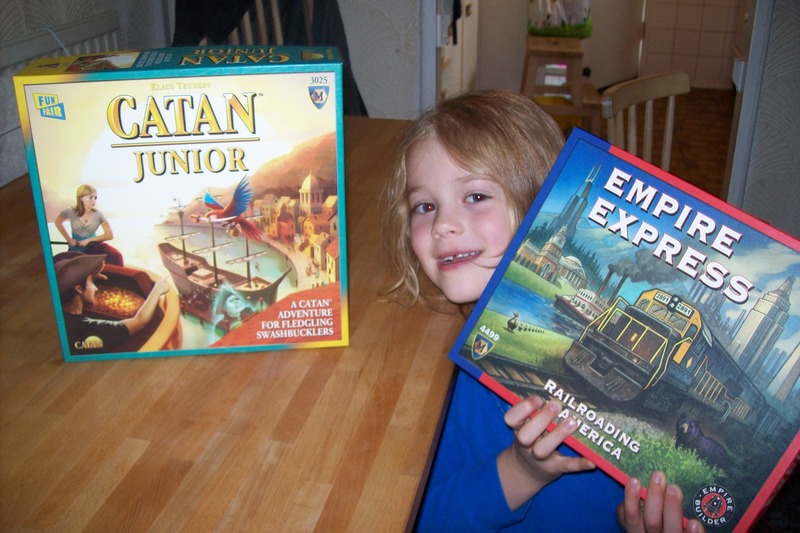 Personally I think Catan Junior is a better kids/family game, but I’m delighted because it means we’ll get to play Empire Express again very soon. If you’ve been reading this blog for a while (or have rummaged around in the archives), you may be aware that for the last couple of years Miss B and I have given a notional award for some game that we think is good. So, in what is definitely now an annual tradition, I give you the opening salvo in the 2013 Golden Game Award. If you would like to maintain a sense of suspense, please don’t look at this picture until you have read the rest of the post. This is, of course, a change of name. As Miss B gets older and develops more sophisticated critical faculties, she seems to be developing a knack for spotting when I am talking absolute rubbish. As part of this she has decided that the Golden Thingummy is not a title suitable for such an auspicious endeavour as this (possibly not her exact words), so from now on we have a new, more sensible name. 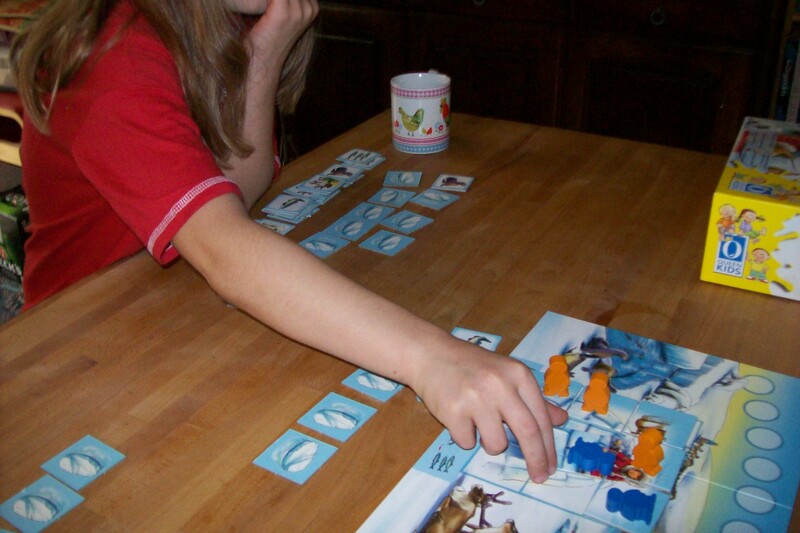 The rules are this… We have a shortlist of four candidate games from those that we have played over the last year, two picked by Miss B and two picked by myself in a vain attempt to choose something that she might prefer to her own picks. The games, incidentally, must be ones for us to play with just the two of them, so Apples to Apples is off the cards. We then have two game-offs, playing one of her choices and one of mine back-to-back before discussing how the games went and getting Miss B to choose the one she preferred on the day. Then the two winning games go through to a grand final game-off to decide which will be awarded the prize of… Well, nothing, not even including prestige. In 2011 the winner was Enchanted Forest, played with simplified rules. In 2012 Miss B couldn’t decide an outright winner, so Dominion and Robo Rally (also with some rule concessions to make it viable for a 5-year-old) shared the honours. Miss B’s choices were Empire Express and Enuk. Two more different games can hardly be imagined given the candidates, but they are both games that Miss B loves and Empire Express in particular doesn’t get played as often as we would like due to it taking a comparatively long time to play (the box says 60-90 minutes, which is probably about right for the two of us). My choices were Augustus and Catan Junior, both of which are quick, fun and work some of those Euro-gaming muscles a little. Catan Junior is a great game to have in the collection and one which we have, in the past, pulled out when a friend of Miss B’s came for a play date. So, over the next week or two I plan to post the gory details of our game-offs. Can you handle the suspense…? Can I just draw on Canada? Years ago I had quite a lot of time playing games with a lovely family who kept on letting me into their house despite the fact that I spent a lot of the time eating their food and playing their board games. 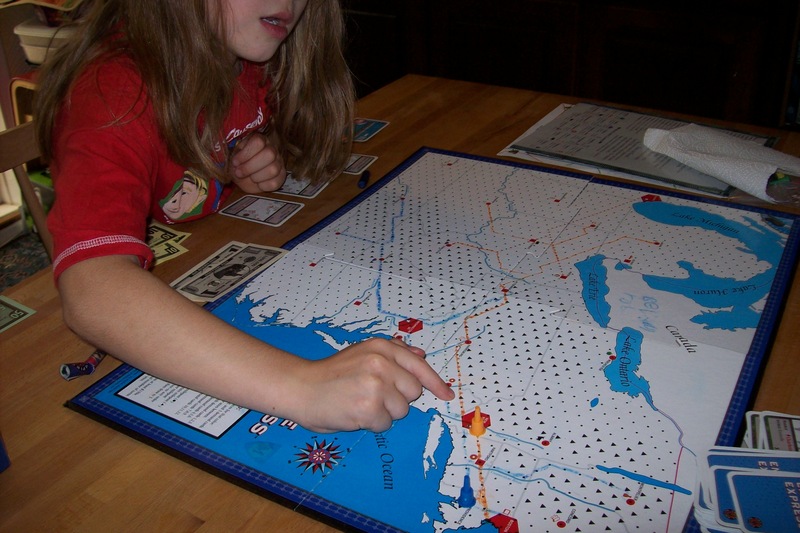 Several of the games we played regularly came from the “Empire Builder” range of train games, including Euro Rails, Nippon Rails, and Iron Dragon. They all shared the mechanic of drawing a rail network onto the board with crayons and then driving trains around delivering goods to fulfil demands specified by cards. This was all good stuff, though the games could go on for quite a long time. The green track gets extended to DC, lining up a couple of big payouts. Recently I found out about a newer member of the range, Empire Express, which stripped out some of the more complicated elements of the system (which nonetheless weren’t actually complicated), made the map smaller, provided a core railway to get you started, and sped the game up quite a lot. Sold! I’m quite impressed with the optimisation of this game. The fact that you can start with a load of track already built and some demand cards that fit that track means that you are off to a flying start without having to have a few turns of trying to figure out a plan and initial network from whatever dross you are dealt. To be honest I missed the train upgrades, which aren’t available in Empire Express but are in the sister games. But the easier start and speed of play make up for the simplifications. Miss B and I took about 90 minutes to play this from a standing start, which is far quicker than I expected. Miss B took to the crayon aspect like a duck to water. She didn’t need much help with route planning or drawing; we quickly got into a routine where when she drew a new demand card I would explain her options from it, she would make a decision as to how it would fit into her plan, and then she was off again pretty much on her own until a new card came out. 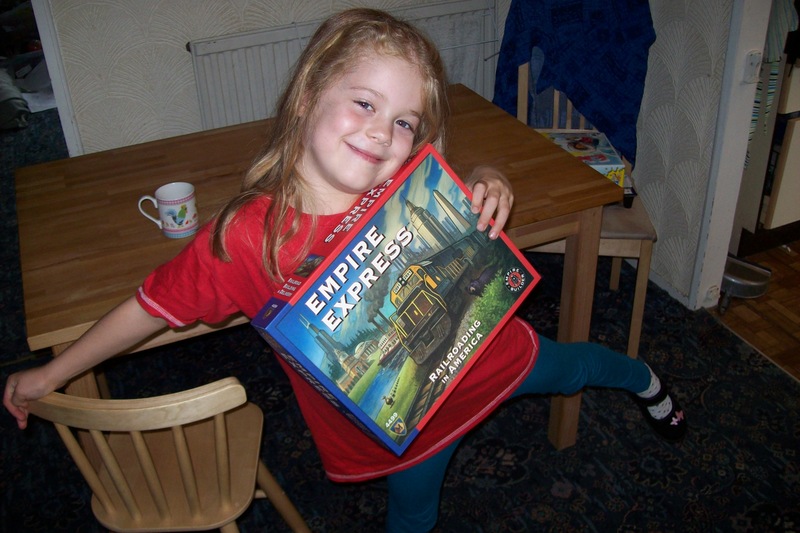 The game: Empire Express (Mayfair Games), 2 to 6 players aged 10+. Why can’t they jump over the fences?